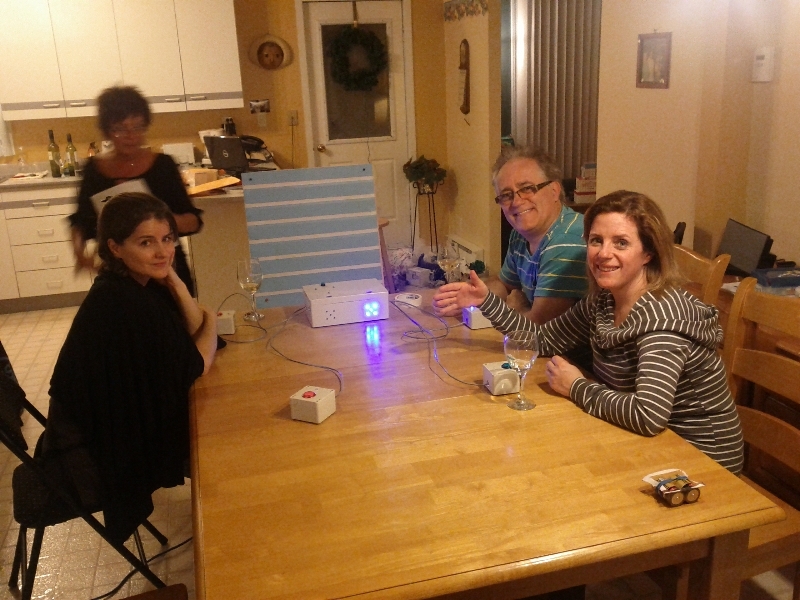 Last Christmas I built a Quiz Buzzer System for my mother. She is a big fan of television quizzes and love to organize some with her friends and family. The particularity of this project is that you can choose your team buzzer sound from a list of more than 30 digital sounds. 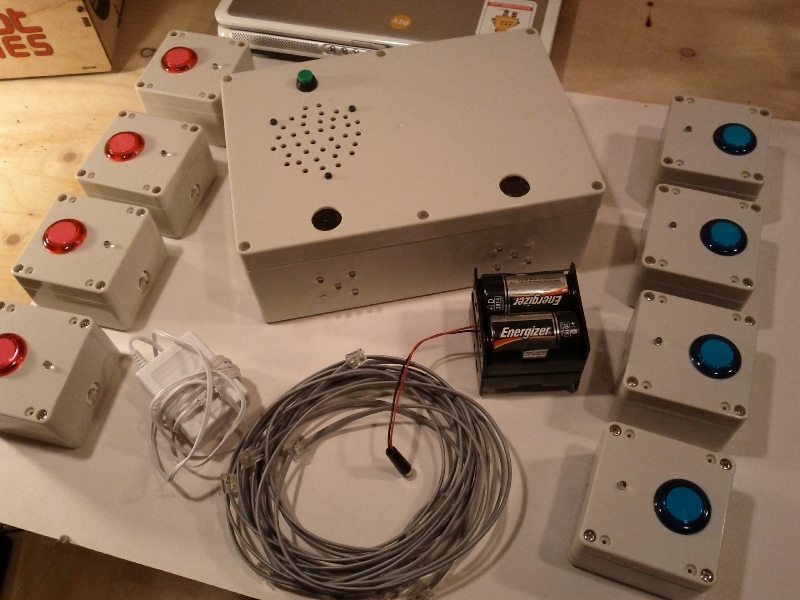 The system is composed of a main console, 8 buttons, a power supply and a set of telephone cables. 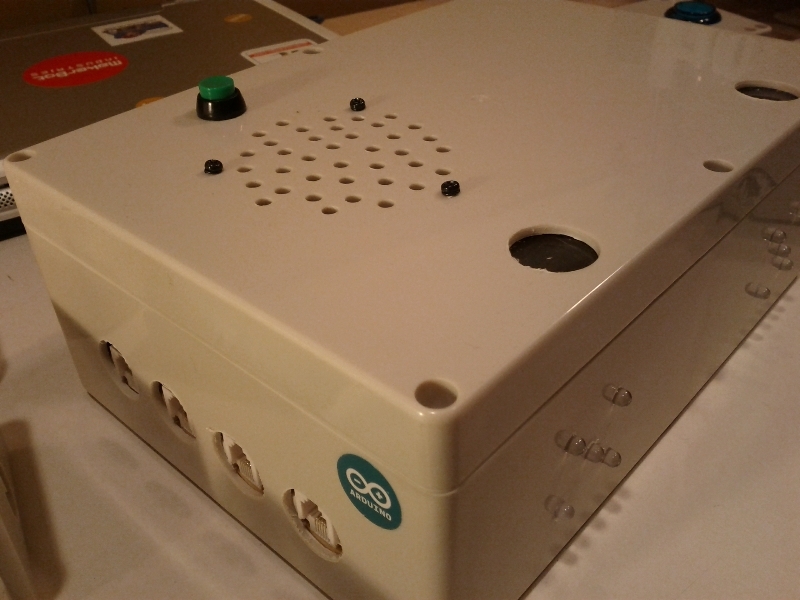 The core of the console, built in a plastic project box, is made of an Arduino Duemilanueve micro-controller coupled with an Adafruit wave shield. 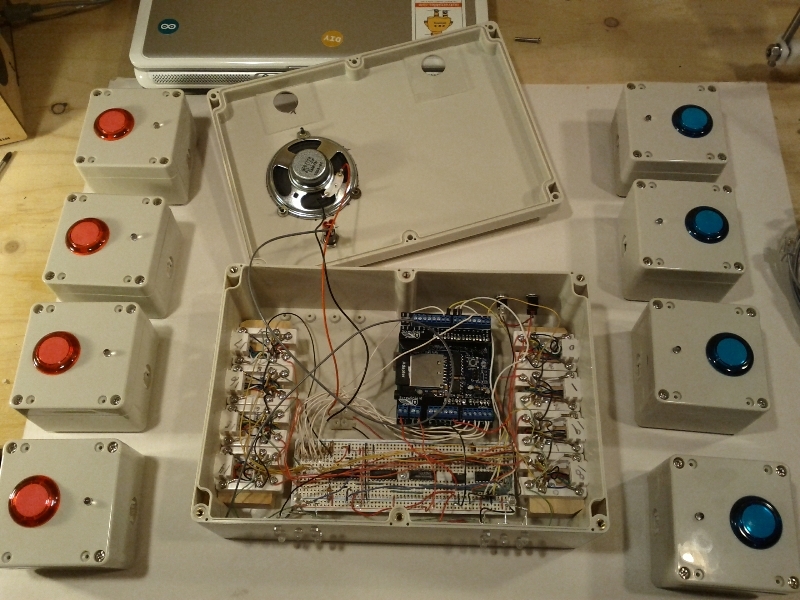 The 8 buttons are made out of small project boxes and arcade buttons, again from Adafruit. 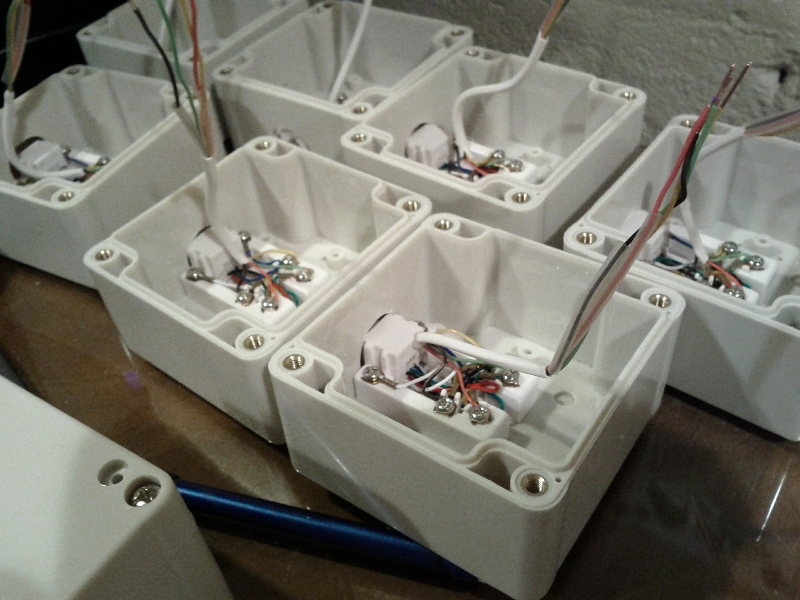 The buttons are connected to the main console using telephone jack and cables. 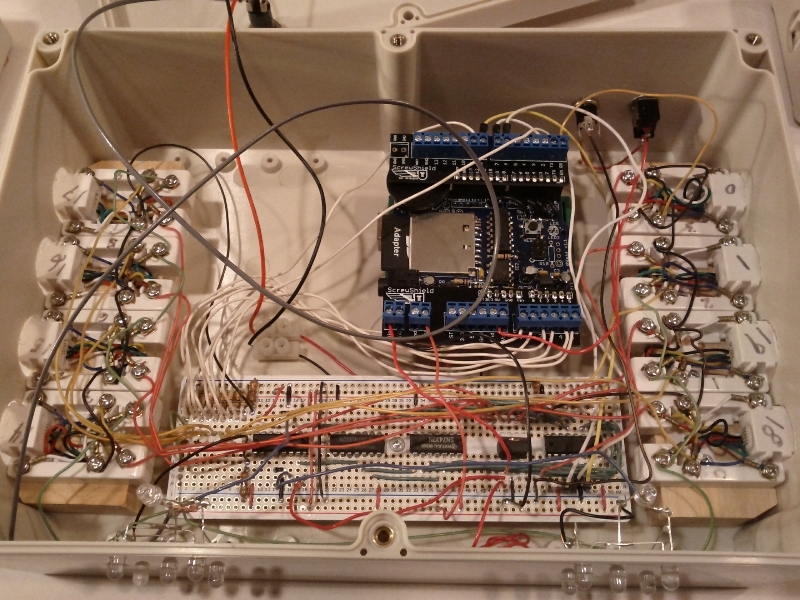 For this project I am using all the IO available on a standard Arduino board. I even have to use the pins #0 and #1 to achieve my goal. 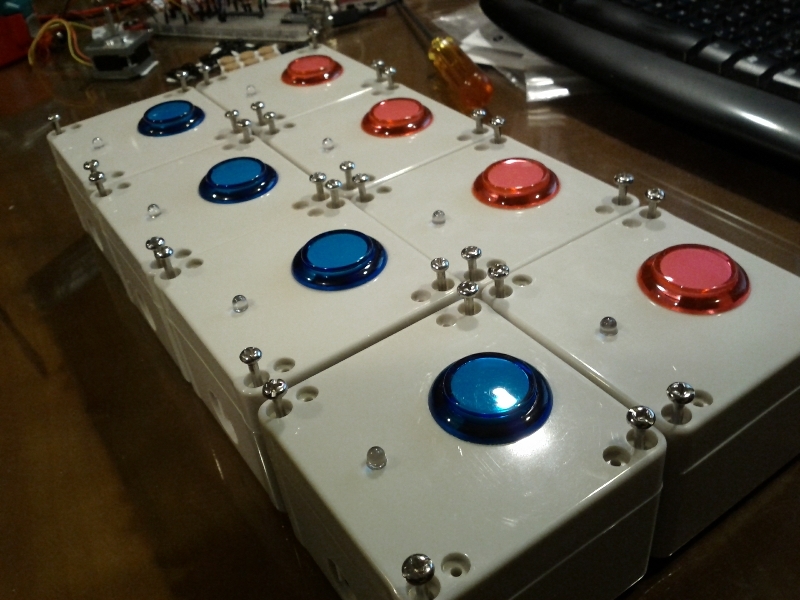 To drive the buttons LEDs I am using a 74HC595 shift register chip. 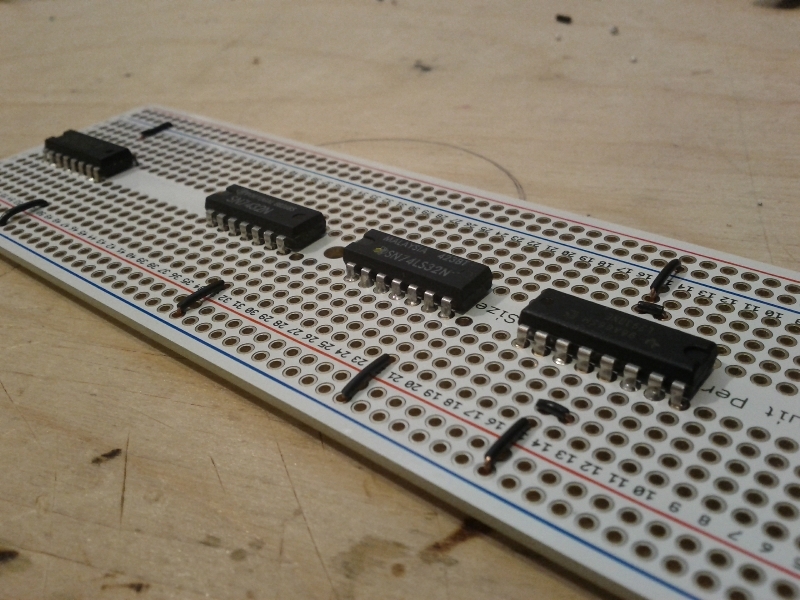 To drive the control panel LEDs without using additional IO pins I am using two 74LS32 OR gate chips. 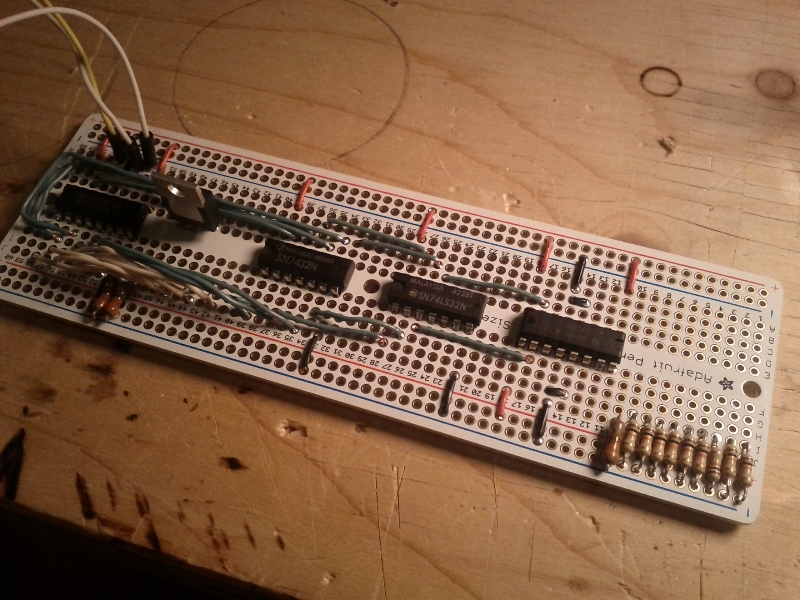 Finally, to drive the cluster of LEDs I am using a L293 driver chip. 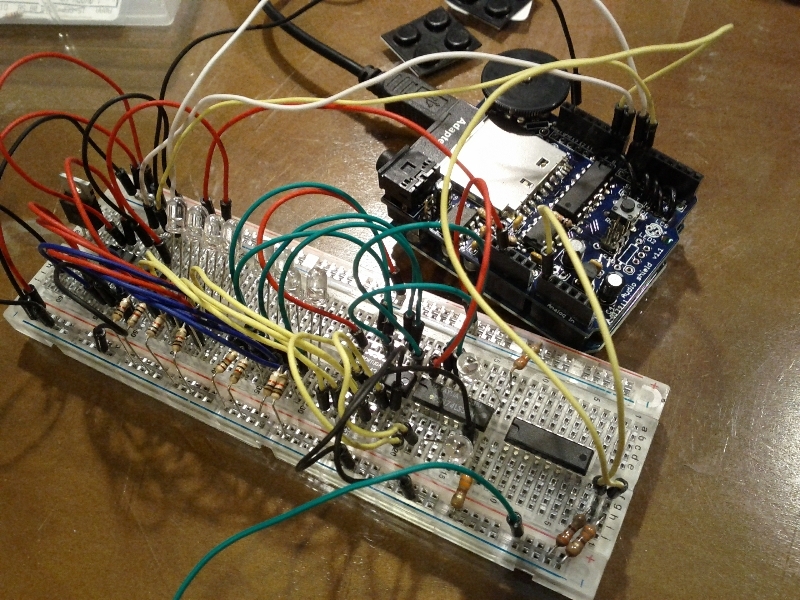 You can find the Arduino source code on my Github at https://github.com/pchretien/quiz. Any chance I could commission you to build me a set? Wow! Your quiz buzzer set looks incredible. You must be busy, but is there any way you could publish your schematics and any more details on how you constructed the set? I would really like to give it a try. In any case, your description and photos are inspirational at the least. Have you posted the schematics? I’m interested in the boxes you used. I’ve got a project for my wedding nearly complete, but I need a good case. 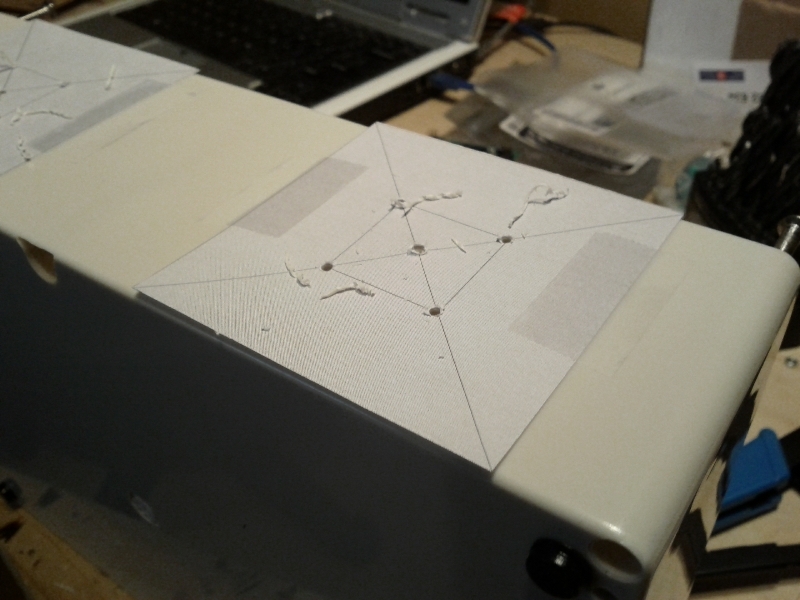 Right now, I’m just using a cardboard box, but that will not do for the final version. I bought my boxes in a local electronic surplus store but you can find many websites selling these. 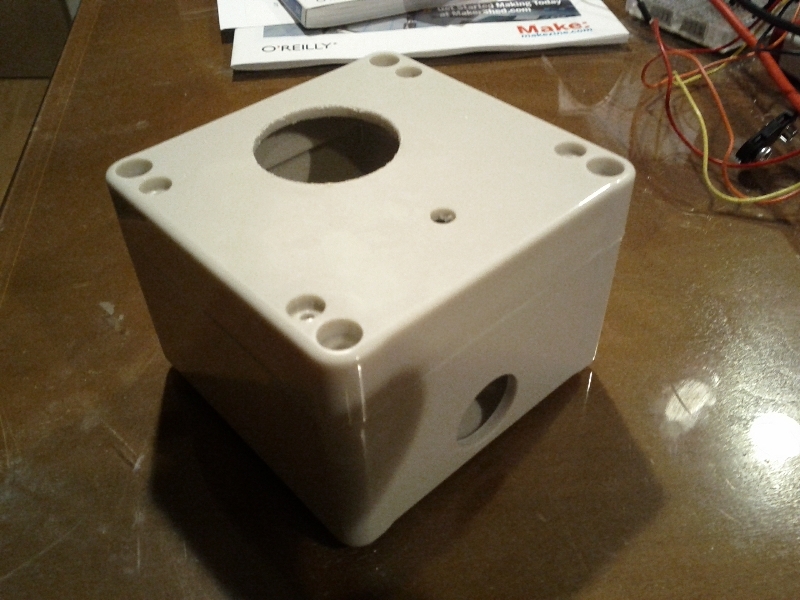 Search for “electronic project box” and you will find what you want. 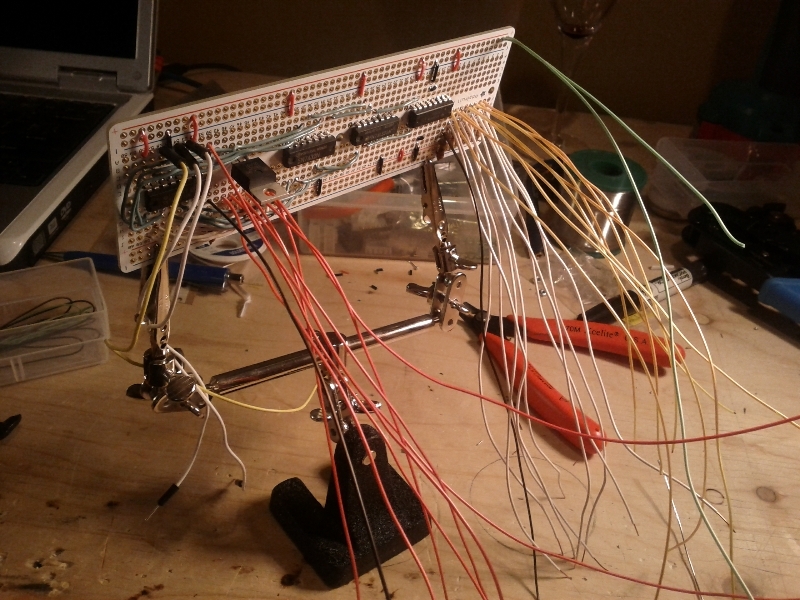 I too would love to see schematics for this project. 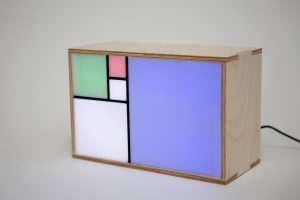 It’s the best looking DIY quiz system I’ve seen around. Did you ever end up posting them anywhere? Unfortunately I wanted to do it for a long time and never had time!